1986, 80s Beginners, Retro Designer Clothing Patterns - MISSES' DRESS AND HIP BELT - FOR STRETCH KNITS ONLY: Pullover loose fitting dress has concealed front buttoned closure, extended shoulders, shoulder pads, elasticized waistline and may be worn with purchased belt; gathered skirt has front and back yokes and machine-stitched hem. Optional contrast hip belt (for stretch knits only) has gathered front buttoned opening. 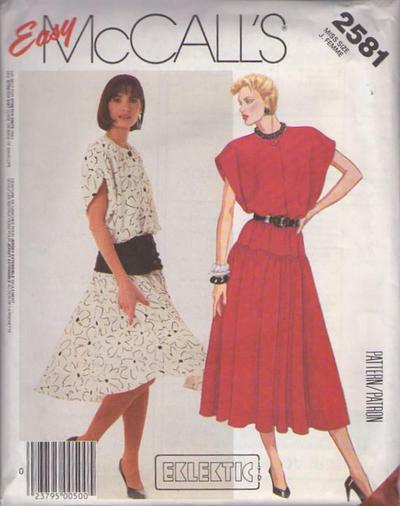 CONDITION: This original vintage sewing pattern is out of print, New Old Stock, uncut & unused! All pieces appear to be complete and intact and have been neatly refolded with the original instructions. Envelope was cut open along the sides.